Tony's Take A couple of weekends ago we went to our local drive-in movie theater (the Stardust) and enjoyed a nice double feature: Cloudy with a Chance of Meatballs and Where the Wild Things Are. Personally, I had very few expectations for Cloudy as I knew very little about it. Steph asserted that she had heard it was funny, and that was enough for me, as Steph is usually right on when it comes to what I’ll like. As far as Where the Wild Things Are, my preconceptions were a little different. I had seen (as had we all) the preview where they blast the Arcade Fire song and all the imagery just breathes in time to the music and it is magic. Fortunately for Spike Jonze this was enough to convince me to shell out my seven dollars (that’s right, seven dollars for two movies) and sit in our car for several hours. Unfortunately, I also knew that Dave Eggers had a hand in this movie so I really didn’t know what to expect (I like McSweeney’s well enough, I suppose, though not usually the parts Eggers himself writes). Cloudy with a chance of awesome is more like it! Regarding Cloudy, it was hilarious. The voice acting was top-notch, the animation was gorgeous and stylish in a way that was evocative of claymation, in the best possible way. You’ll recall that I am a big fan of the late Clone High, and it so happens that this movie is by the people who brought us that short-lived gem. Which explains a lot. In the end the story wasn’t perhaps the most compelling, and it ran a rather predictable course (with one notable, disgusting, meatball-like exception) but still managed to be not only hilarious, but also engaging. So, despite a weak spot regarding depth of story, this movie managed to be one of my favorite animated films of the year and certainly a stand out in the comedy department. I’ve kept the review short and sweet, like the movie, because there isn’t much to say beyond this: this movie is likely to be overlooked in favor of larger, more well-financed feature films, but is worth the time and deserves attention. By now we had long finished our Philly Cheese Steak, chili-cheese onion rings (a new Steph invention!) and jumbo drink (this theater has the best concession stand I’ve ever seen) and the temperature was steadily plummeting. Time for funnel cake and hot chocolate! And the next movie, I suppose. Let’s start with the things I liked about Where the Wild Things Are. It’s less sad that way. The visual style was very, very nice. There was perhaps a little too much freehand camera work, but overall the style felt very otherworldly, yet still very real and present. There was the constant question of whether or not the monsters were puppets or not; turns out they were in fact animatronics, which is cool. The music was very good. I like the Yeah Yeah Yeahs, so I like Karen O. and the Kids. Mostly. There are some children’s chorus moments that are a bit much, but overall the music is used to great effect. Interestingly Arcade Fire does not feature anywhere in the movie, it’s all Karen O. The voice acting is done by some top actors and is all very solid. James Gandalfini is great (he has been in some good stuff since The Sopranos, namely In the Loop which was really good) and Chris Cooper is a perennial favorite. So there was all of that, which was fine and dandy. But. The movie started out on a bad foot with me, first thing, it just left a bad taste in my mouth. After 20 minutes we were both considering bailing. Seriously. Anyway… The movie opens with The Main Kid (Max) dressed in his wolf suit chasing the dog around the house with a fork. The dog is barking frantically and TMK is growling, well, like an 8 year old wolf. He catches the dog and the credits begin. Man oh man, if that were my kid terrorizing my dog, that would be one sad kid. He would already have a reason to escape to monster land. The premise this sets for me is one that implies that TMK is slightly developmentally challenged. I’m not saying that I have a problem with that, just that he annoyed the piss out of me and I immediately lost any sympathy for him. He causes trouble and then wonders why things go badly for him. Call me crazy, but that is annoying. I don’t know for sure how old he is supposed to be or how a child of his indeterminate age is supposed to act, but he seems off to me. I can’t say I’m a fan of the whole single mother trying to make her way while her child fails to understand her needs thing, it just felt really tired in this movie. I’m certainly not knocking single mothers or anything like that, I just think this could have been handled with more aplomb — or avoided. So TMK gets to monster land and all the monsters are pretty much thinly veiled, dysfunctional metaphors for his regular life back home. All this talk of leaving and staying together and anger over troubles in life and how you can’t escape yourself and on and on and on. None of it was particularly well written or subtle and the constant banging on the door of the house where “the wisdom of a child” lives got really old. It’s one thing to craft a piece of writing that is simple yet profound, much like minimalist art, and when it’s done right a little says a lot. But then you have the other side of the coin, where everything feels lazy and contrived and worn out. That was the dialogue and plot of this movie. It was nothing more than an attempt to sound profound by showing us the trials of a boy in a harsh, grown up world that he is too small for, doesn’t understand and can’t control. The book did this wonderfully, with ten lines. The movie, not so much. Since I wasn’t rooting for the boy, and the monsters were boring, all that was left was some good music, nice visual effects and pretention. Blech. More like "Where the Boring, Over-intellectualized, Over-hyped Things... Are." Yeah, take that. Totally agree with you both on Where the Wild Things Are. I too just wanted it to be over with. However, if I had had chili-cheese goop to keep me occupied, I might have been happier. I Loved Where the Wild Things Are as a child and my son enjoyed it too. I treasure my memories of the book and my own imagination in filling in between the lines of the story. I definitely won’t pay to see the movie in the theater but will probably consider it when it comes on Netflix or something. Thanks for such an honest assessment! 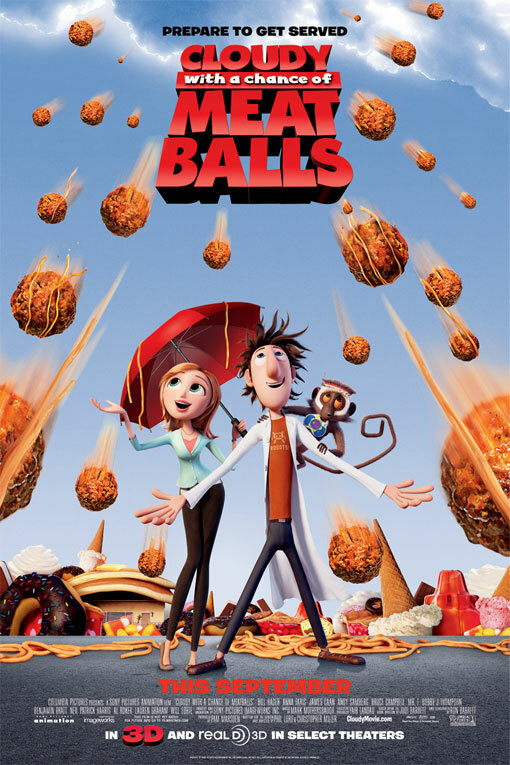 I took my kids to see Cloudy With a Chance of Meatballs, and I have to agree, it was really funny and well done. I didn’t really expect to have such a good reaction to the movie, mainly I went for the kids, but even very early on I was really engaged and entertained. It had a lot of laugh out loud moments, and even my husband (who is a curmudgeon about kids movies) had a really good time. 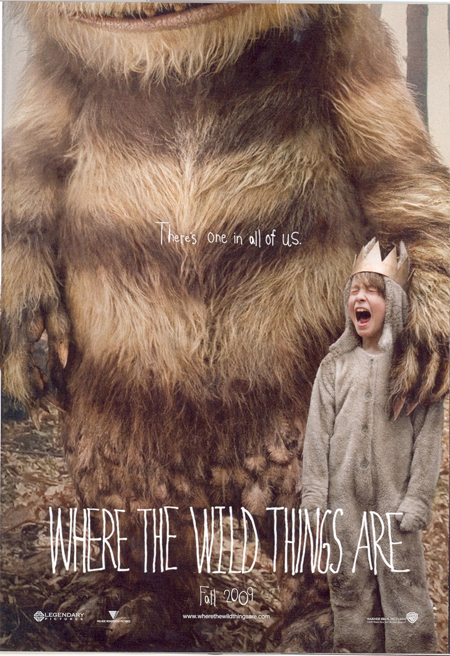 On the other hand, I have really tried to avoid Where The Wild Things Are because something about it just bothers me. I can’t quite put my finger on it, but after seeing the previews I was vaguely disquieted. I decided that no matter how much praise I heard about it, it just wasn’t for me. I never read the children’s book when I was younger either, so mainly the monsters just came off as kind of creepy to me and not as fabulous as other people seem to think they are. It’s funny, but I haven’t heard much about this movie since it’s come out. There seemed to be a big hype and push before it was released, but not so much after. Maybe I just missed it. I really liked this double-double review. I think it’s really interesting to have gotten both of your opinions on these movies. Going to stop rambling now! Ohhh.. so sad to hear about WTWTA. I did get a heads up from Frances not to let my kids watch it though, until they’re older. But anyway, really love the book by Maurice Sendak, it’s one of my most fave picture books ever. I’ve Eggers’s book waiting on the tbr. I tried reading a few pages, and have seen that it isn’t up to par with What is the What at the start, so I won’t expect much from it, although I seriously hope I still find it enjoyable. It’s a book that I’ve been waiting for for ages! But I do know Zeitoun is going to be fantastic as I’d read the first pages and loved it instantly..
We’ll watch CWACOM soon with the kids, they’ve been clamoring! They also like the book. @ rhapsody: Alas, the chili-cheese goop was consumed during CWACOM, so we didn’t have that to buoy us during WTWTA… but we did have funnel cake, which was still something! @ Kathleen: It may be different for people who read the book and loved it, so I’ll be curious to hear your take on the movie should you get around to seeing it. Definitely wait for DVD though – you never feel quite so bad stopping halfway through rented movies! @ zibilee: You’re right that there was a lot of hype for WTWTA before it was released, but then not very much since then. It only got a 70% fresh rating on Rotten Tomatoes, and given the expectations most had going in, I think that’s a fairly bad sign. But I’m glad to hear your family enjoyed CWACOM, even your anti-kids movie husband! @ Eva: I think your mom was right about the actor playing Max – not having read the book, we couldn’t figure out how old he was supposed to be! Because he looked to be about 10 – 11, but then acted way younger than that, and needless to say, it was… concerning. But don’t apologize for the Vince Vaughn love – haven’t seen Couples Retreat but he is awesome in Dodgeball! @ Claire: I’ve read some things suggesting that WTWTA might be scary for young children, and I suppose that the interminable boredom is punctuated with scenes that could scare the younger bunch, so it is probably best to hold off (in my opinion for forever, but even a couple of years would be good! 😉 ). I hope you guys enjoy CWACOM – it’s fun and not at all scary! Well, that confirms what I had heard from friends on both movies. I was afraid WTWTA would be a little flat and boring and pretend to be profound. I think I’ll stick with the trailer instead – I’m a long time fan of Arcade Fire and it was simply beautiful. Then, I’ll rent CWACOM once it’s out of DVD. @ Kay: Wait, you’re from Montreal and like the Arcade Fire? Crazy! 😉 Seriously though, the trailer for WTWTA is really spectacular, and if the movie had lived up to those 3 or 4 minutes, it would have been breathtaking. But it REALLY REALLY didn’t. At least you can look forward to CWACOM on DVD!